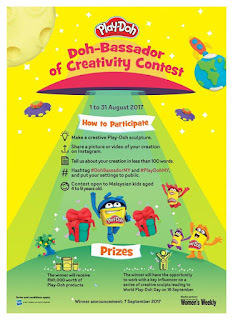 The search is on for Malaysia’s most creative child as Play-Doh kick starts its inaugural ‘Doh-Bassador of Creativity’ from 1 – 31 August 2017. Organised by Hasbro Toy (Malaysia) Sdn Bhd, the contest invites children aged four to nine years old from around Malaysia to ‘Open A Can of Imagination” to produce their most original and creative sculpture using Play-Doh compound. With unlimited entries, the only limits are the limits of your imagination! Participation is easy and simple. All that is needed is to share a picture or video of their most creative sculpt made from Play-Doh compound on Instagram. All profiles need to be public and participants are required include a short description of their creation in less than 100 words, together with the hashtags #PlayDohMY and #DohBassadorMY. 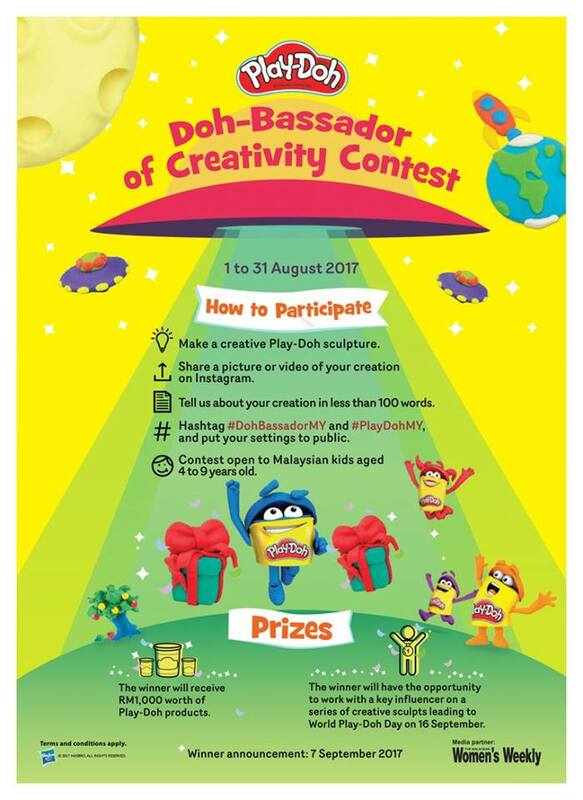 Apart from receiving RM 1,000 worth of Play-Doh products, the appointed Doh-Bassador of Creativity will also have a chance to collaborate with a key influencer to create a series of Malaysian-inspired sculpts in celebration of World Play-Doh Day and Malaysia Day, both falling on 16 September 2017. The Doh-Bassador of Creativity campaign is supported by The Malaysian Women’s Weekly as their media partner. With humble beginnings as wallpaper cleaner, the Play-Doh brand has come a long way. Starting off with only four colours of red, blue, yellow and white when they started, the modelling compound brand is now available in more than 50 colours! More than three billion cans of Play-Doh compound have been squished and squashed since 1956. Following Play-Doh’s 60th Anniversary last year, the Play-Doh brand continues to encourage creative, hands-on play with its various playsets such as Food Role Play, Shape and Learn and the brand new digital playset Play-Doh Touch.